Since the 1940s mass vaccination programmes have formed important elements in the governmental provision of healthcare services to children. Collectively, they have reduced the incidence and severity of numerous childhood diseases. Yet, they have also been subject to moments of social anxiety and panic over safety issues, necessity and the reach of the ‘nanny state’. These issues remain as ever present today as they did in the 1940s. They speak to the wider historical development of vaccinations, their introduction in Britain and how the NHS became the central instrument for providing childhood vaccinations free of charge to the public. While mass vaccination pre-dated the NHS, the launch of the NHS coincided with the considerable increase in the types of diseases for which vaccination programmes were developed and introduced in Britain. Vaccinations against diphtheria, pertussis (whooping cough), tuberculosis and polio were all provided to children by 1956 and as the century progressed so too did the array of diseases for which vaccines were developed and introduced in Britain. Routine vaccination of children has occupied an important place in childhood interactions with the NHS and it was the National Health Service Act itself that secured the place of vaccination within state-funded child health services. Before this, smallpox was the major disease subject to routine vaccination. Diphtheria vaccination in particular had suffered from apparent political indifference throughout the 1930s, which slowed its introduction. Local authorities were responsible for funding such vaccination programmes before the introduction of the NHS and as many were already burdened with operating infant welfare clinics and dispensaries, they were reluctant to accrue more expense and commitment. The outbreak of the Second World War provided the necessary impetus to introduce diphtheria vaccination with central government allocating funds to local authorities to meet the costs of introducing the programme. By the end of 1942, a third of all children under 15 years of age in England and Wales, and a half of all in Scotland had been protected against diphtheria. While this was a major step in widening the availability of vaccination against certain childhood diseases, it was not until the passing of the National Health Service Acts of 1946-8, which established the NHS, that a major sea change in vaccination provision was secured. The Act strengthened the policy for subsequent introductions of childhood vaccinations and allowed the National Health Service to take responsibility for co-ordinating both current and future vaccination programmes. Within two years of its establishment the NHS was providing routine vaccination against both pertussis (whooping cough) and tuberculosis in addition to smallpox and diphtheria. The BCG vaccine against tuberculosis was first offered to nurses in 1949, a particularly susceptible occupational group. By 1950 the Medical Research Council began a vaccination trial on 56,000 school children but the widespread vaccination of children began long before it reported its results in 1956. Indeed, by the end of 1950 BCG vaccination programmes were operating in earnest throughout Scotland and had spread nationwide by early 1953. These vaccination programmes can be viewed as an important aspect of postwar welfare provision and as part of the Labour government’s wider attempt to introduce greater equality in health provision in the years after the Second World War. In the years following the launch of the National Health Service, numerous other vaccination programmes were introduced, mainly aimed at protecting childhood populations. During the early 1950s there were a number of severe polio epidemics with as many as 8000 annual notifications of paralytic poliomyelitis in Britain. Routine vaccination against polio with inactivated virus began in 1956 and was later replaced in 1962 by the live attenuated oral polio vaccination, memorably delivered on a sugar cube. Following the introduction of the vaccination, cases of polio fell dramatically with the last indigenous outbreak occurring in the late 1970s and the last case of natural polio infection acquired in Britain in 1984. Vaccines for other childhood diseases followed with vaccination against measles introduced in 1968. Before the introduction of the measles vaccine, notifications of measles varied between 160,000 and 800,000 cases a year with peaks biennially. 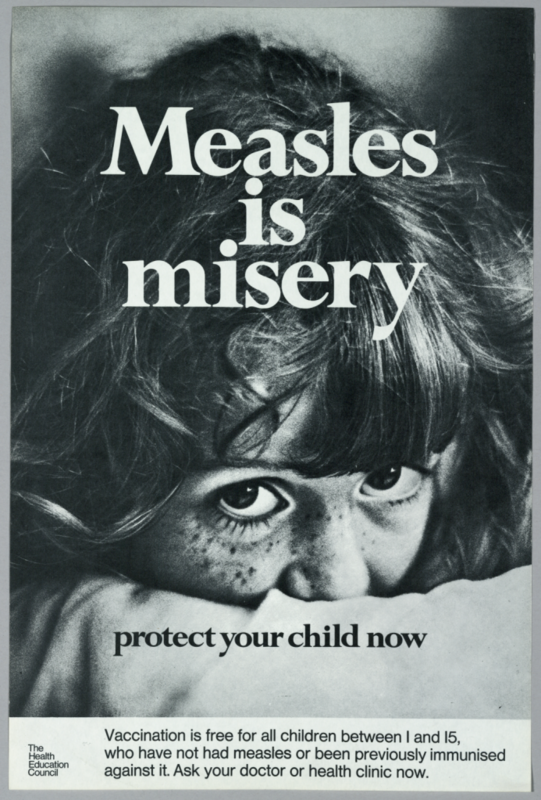 From 1968 until the late 1980s coverage was disappointingly low and was insufficient to interrupt the spread of measles. Annual notifications only fell to between 50,000 and 100,000 and measles remained a major cause of childhood mortality and morbidity. Between 1970 and 1988, there continued to be an average of 13 acute measles deaths every year. The introduction of the measles, mumps and rubella (MMR) vaccine in 1988 helped turn the tide, achieving coverage levels in excess of ninety per cent. Consequently, measles transmission was substantially reduced and notifications of measles fell to very low levels. The introduction of the MMR also provided much needed protection from mumps and rubella. Prior to 1988 mumps commonly occurred in school-age children with eighty-five per cent of adults having evidence of previous mumps infection. It was the most common cause of viral meningitis and resulted in over 1200 hospital admissions each year in England and Wales. High uptake of the MMR vaccine ensured that incidence of the disease fell substantially. Catch-up programmes were introduced in the 1990s to prevent a major mumps outbreak amongst those children who were initially too old to receive the MMR upon its introduction in 1988, as unlike for measles and rubella, a single mumps vaccine had not previously been available. A vaccine for rubella had been available to pre-pubescent girls and non-immune women since 1970 to prevent the disease in pregnancy where it may result in foetal loss or congenital rubella syndrome. The introduction of the MMR provided universal immunisation against rubella and aimed to interrupt the circulation of the disease among young children and therefore provide protection to the adult female population by limiting exposure. Since the 1990s, the childhood immunisation programme has continued to grow in scope, with both new vaccines introduced and existing vaccines combined with others to create such combined vaccines as the 4-in-1 and later the 5-in-1. In particular, the haemophilus influenzae type b (Hib) conjugate vaccine to protect against the common presentation of meningitis and bacteraemia was introduced in 1992 and later offered as a combination vaccine with diphtheria, tetanus and pertussis (DTwP/Hib) from 1996 and later as part of the 5-in-1 with diphtheria, tetanus, pertussis and polio (DTaP/IPV/Hib) from 2004. Vaccines against other types of meningitis have also been introduced to provide long-term protection from these bacterial infections. Vaccines against strain C have been provided since 1999, from pneumococcal (PCV) since 2001 and from B and ACWY since 2015. The HPV vaccine has been made available under the NHS vaccination programme since 2008 to girls ages 12 and 13 to protect against cervical cancer in adulthood. Rotavirus and influenza vaccines for children have also been introduced to prevent the highly infectious stomach bug causing acute dehydration and the incidence of flu amongst the under fives. The ever-increasing reach of the vaccination programme, made available to all through the National Health Service, has successfully reduced the incidence of the diseases covered by the programme. The programme continues to evolve with new vaccines added and vaccines that are considered no longer necessary removed. In particular, the BCG vaccine against tuberculosis is no longer offered on a universal basis but rather to at-risk groups, reflecting the changing epidemiology of tuberculosis in Britain. Over the lifetime of the National Health Service vaccination has remained an important element of both public health and service provision. It has combined health education with medical intervention to prevent the incidence of many serious childhood diseases with vaccination programmes accompanied by national publicity campaigns to encourage high uptake. In many ways the provision of vaccinations represents the most successful example of postwar preventative medicine aimed at encouraging the public to engage in healthy behaviours – in this case bringing both themselves and their children for vaccination – to maintain the healthiness of both the individual and the family. I clearly remember going with my Dad into Birmingham City Centre to have a Polio vaccination. After giving my details to the lady at the corridor window my Dad was asked for his details. He was very clear that he hadn’t come for vaccination. The generous lady informed Dad that it was fine and he was entitled to have the vaccination as well. He very firmly declined. Imagine his face when we got to the front of the queue when they gave me the sugar lump! Haha that’s a great memory, thank you for sharing! Would you be happy if we tweeted this and added it to our memory section on the website, peopleshistorynhs.org/sharestory ? I’d love to share it further! I remember having a polio sugar about age 11. A few weeks later I had excrutiating backache was hospitalised with what they called an infection at the bottom of my spine. My dad said it looked like a mild attack of polio. I was in hospital for a few months and then a plaster cast put round my back twice. This lasted for about three months. I was off school for months. I had to sit one of my intelligence tests in hospital. All in all I didnt get any of my five children vaccinated. All very healthy they in turn havent had their children vaccinated.